Ah, almost midnight and here I am, desperately typing out a blog post that is long overdue. Feels just like old times. Old times being like two months ago when I clearly remember warning you of my impending silence. Not only did I make it to summer vacation with all most of my sanity intact, but we managed to survive The Great Move of 2014 with limited casualties. We did lose a lego man who succumbed to a suspicious looking skin condition after being trapped under the fridge for an indeterminate amount of time. (I kid you not, I felt horrible about throwing him in the trash. 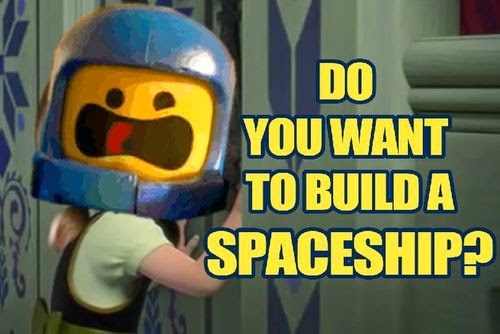 I blame the Lego Movie.) Now we're all settled into the new house and taking quite nicely to life in good old-fashioned suburbia. Seriously, our next door neighbors have already brought cake and offered up the babysitting services of their teenage granddaughter. We now have a garage and underground sprinklers and a sunken living room where I anxiously watch out the window as my children walk two houses down, BY THEMSELVES, to play with their friends. I feel like I've finally been admitted to the sacred and hallowed halls of adulthood. And I am okay with this. So. Recap: Life happened. Busy. No posts. Back. More posts soon. Until then, enjoy this badly photoshopped, yet epically hilarious thing I found on Pinterest. Because it made me giggle. Also, because it really is midnight now and I'm too tired to come up with a more clever sign off.